Kellie Chambers, L.Ac., MAOM, Dipl.Ac., Owner and Operator of MoonTree Medicine, and independent contractor at Hawthorn Healing Arts Center in Bend, Oregon, has studied Chinese Medicine for over a decade. As a Licensed Acupuncturist, focusing in Classical and Taoist approaches to health and balance, Kellie utilizes several modalities including Acupuncture, Asian Bodywork, Chinese Nutritional and Herbal Medicine, Qigong Therapies, Cupping, Gua sha, Moxa, Sound therapy and Essential Oils in her unique treatment sessions. Kellie focuses on teaching self healing principles and mindfulness cultivation in all of her consultations. Kellie’s love of plants and nature led her to a B.S. in Botany and Plant Pathology at Oregon State University. But it was her awareness of Qi (and several Aikido injuries) that led her to earn a Master of Acupuncture and Oriental Medicine from the Oregon College of Oriental Medicine in Portland, Oregon. Kellie went on to train with Dr. “flying needle” Wong, in her post graduate study at the NanJing International College of Traditional Chinese Medicine in NanJing, China. She passionately passes along her knowledge of this ancient tradition of practice to the next generation of Healers through teaching many Cupping and Gua Sha Workshops (Cupping Dynamix, LLC) all over the greater Northwest Region to Acupuncturists, Physical Therapist, Nurses, Chiropractors, Massage Therapists, and many more, wishing to add some Eastern wisdom to their varied approaches to supportive healing. Kellie has been studying meditation in many forms for the past 15 years. 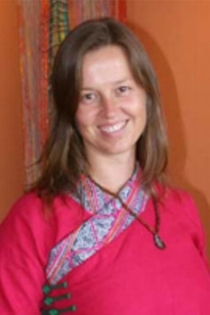 She is a Ling Gui Certified Healing Qigong Instructor and continues to deepen as an avid student of Taoist medicine with the Ling Gui International Healing School of Qigong. In addition to treating patients, Kellie offers weekly QiGong classes and in-depth weekend workshops on a seasonal basis. You can find her current class offerings here. She adds to her qigong healing instruction with a background in Aikido and Zen style Meditation as well as a 200 hour yoga teacher certification, specializing in Yin yoga. Ever the student, Kellie has recently begun a two year training program (timeless wisdom training) through the Academy of Inner Sciences with Thomas Hubl, a contemporary spiritual teacher of uncompromising clarity whose teachings are recognized internationally. When not working with MoonTree, Hawthorn, or Cupping Dynamix, and not studying, you can find Kellie happily exploring on a sailboat, out for a hike, dancing in ceremony, playing with photography, or reading a book by the fire. Learn more about Kellie's teachers here.